Is your church “new” enough? When people think about our churches does the word “new” ever come to mind? We live in a culture that leverages “new” to draw people in . . .how does your church use “new” to point people towards Jesus? Have you ever noticed how theme parks sell themselves? Check out this screen capture from the Six Flags Great Adventure website. Theme parks generally add something new every summer and then use most of their “airtime” to communicate the “new thing” at the park. (Although 98% of the experience is the same . . . the new thing “freshens up” the publics perception of the park.) They are doing something new . . . and then want to seen as doing something new. The new ride encourages people to return to the park. Did you catch the launch of Taco Bell’s Dorito’s Loco Taco? This launch employed a rip, pivot & jam strategy to make an old something new. Taco Bell ripped another brand (and taste) from a related (but not directly connected) market segment. Then they pivoted it into a product of theirs. Then jammed big time to the new product and new messaging out. They talked about it . . . “You love Doritos? 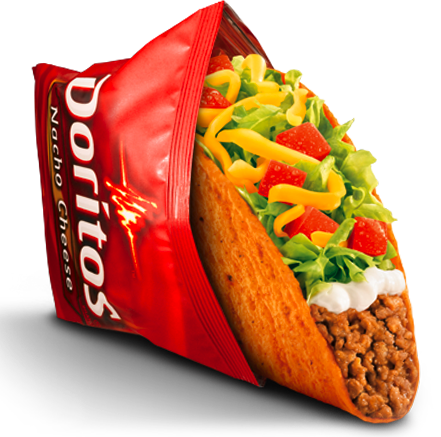 You’ll love this new amazing taco too.” They sold 100 million of these bad boys in the first 10 weeks. That’s a lot of tacos! They refreshed an old idea and then declared it new. What is the appeal of all of these “daily deal” sites? Frankly . . . I’m surprised that this trend has continued. I would have thought that they would died off long ago. But it seems like what is happening is that people are looking for more and more targeted “daily deal” experiences. There is one for ministry resources or entrepreneurs or a bunch of other submarkets. Did you catch Coffee Meets Bagel? Every day at noon it sends singles suggested dates from their “friends of friends” on facebook . . . and gives them a great deal on a date . . . they have 24 hours to ask the “friend” to get the deal. These “Groupon 2.0” sites are offering “new deals” every 24 hours and offering it for a limited time only. People love getting in on something great that they know is going away soon. But what do theme parks, Taco Bell and Daily Deals have to do with the churches we lead? They are all leveraging the power of “new” to help attract more people. I’m wondering what would happen if we found ways to do “new” and highlight “new” wherever possible. So many churches already do this through our teaching series . . . everything 3-4 weeks we “change the channel” . . . but what if this fall we made a bigger deal of “what’s coming up next” . . . What if we encouraged all of our teams to be on the look out for small and big things we can tweak to “new” to help give the impression of our churches rebirthing themselves. Strategically . . . . a big part of what we’re charged with in the communications side of church leadership is to help break the cycle of non-attendance. We know that there are a lot more people that consider our churches home than attend on any given weekend. Our communications needs to help raise the value of what is “new and exciting” at our church and why they should come back. Whatever got your here won’t get your there.